Experience is a very important part of most industries and Cougar Scaffolding has been in business for over 15 years. 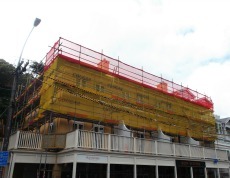 The owner, Grant Heath, began the business from small beginnings and it quickly became a well recognised scaffolding business. We have a large office area which is a good place for discussing plans and ideas with our clients. When phoning or emailing the office, our management team will be able to help you with your enquiries. In the yard we have a large range of equipment that is guaranteed to be in good order from full scaffolding services to dry hire, mobile aluminium towers, planks, ladders etc.